So when Apple co-founder Steve Wozniak isn't dancing with the stars, or joining a storage startup, apparently he's pretty interested in the idea of the "deep Web." It turns out that the Internet that you and I and Google live and work on is but a fraction of the Web that actually exists. The rest—by some estimates, the overwhelming majority (possibly even as high as 99.8 percent)—is unsearchable data that exists out there. This, as the name implies, is the so-called "deep Web." 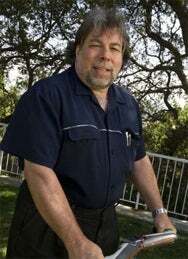 As of today, Woz will be joining the advisory board of DeepDyve (formerly known as Infovell), a Sunnyvale-based startup trying to plumb the depths of this deepest of Webs. So will this make Wozniak the Jacques Cousteau of the deep Web? If so, I hope he does lots and lots of public television specials.